You may come to a time when you realize that some type of trauma has affected you in your life. It may be a small trauma, a big trauma, a chronic trauma, or complex trauma. Regardless of the kind of trauma, knowing how to let it go of it so that those thoughts about it do not keep going around in your mind. It is this letting go that allows for you to take the next step in life…finding peace. The first book in the trilogy contains sixty daily reflective meditations to help you unravel your reactions to past and current trauma. Read and then reflect on what each thought means to you personally and whether your current actions may be related to your reactions to past trauma. Gentle and reassuring, the thoughts will help you better understand your current patterns of behavior so you can make changes for improved health and peace of mind. The second book in the trilogy, Healing My Trauma, contains the next step after understanding it, healing it. This book explores ways to deal with strong and numbing emotions, healing different types of trauma (including relational trauma), and ways to diminish or prevent trauma in the future It takes you one step further in the healing process. After learning to understand and heal the trauma, it is time to let go of the strong or numbing emotions that come with trauma. 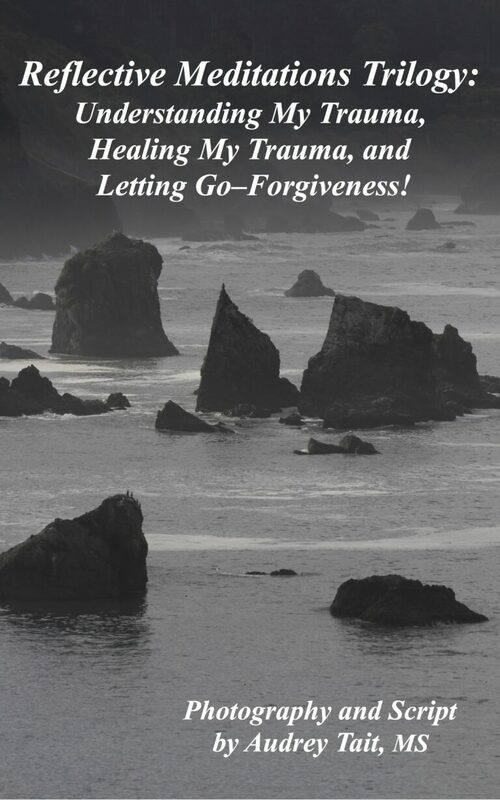 In the last book of the trilogy, Forgiveness-Letting–Go, you earn about what forgiveness is and is not, forgiveness with boundaries, consequences, restitution, and reconciliation. The book ends by discussing how trauma can bring gratitude, as strange as that may sound.